Hello paper crafting friends! Birgit here with you today at the Dies R Us Inspiration Blog and I have a Father's Day card to share with you, since Father's Day is just around the corner. I started by cutting the Impression Obsession Ornate Oval Frame three times out of white card stock. I rubbed some Tim Holtz Distress Ink over the top layers and layered the frame up using different layers, to give it dimension. 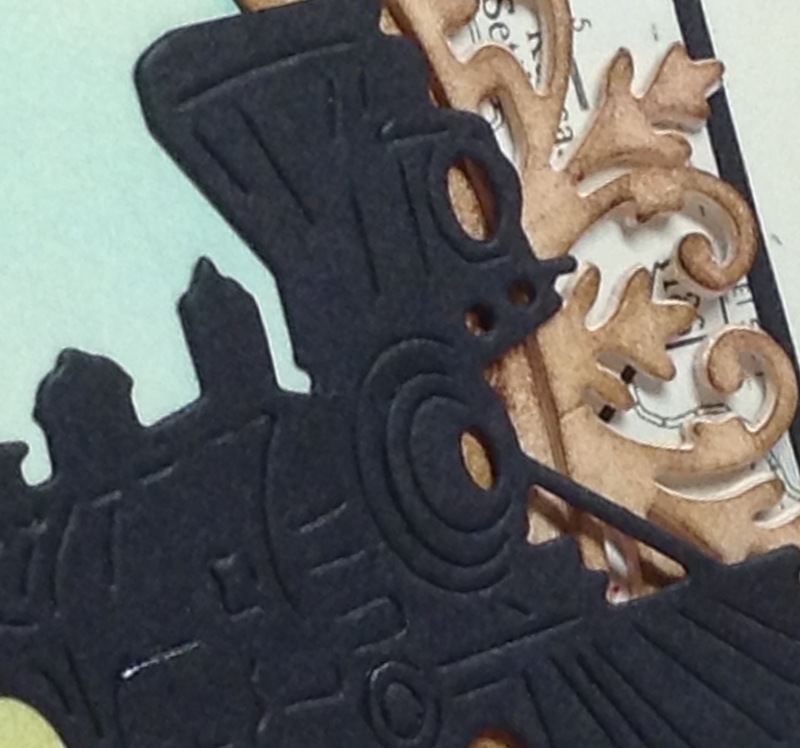 This die cuts all the layers for this frame in one pass so it's quick and easy to assemble. And you can choose which parts of the frame you want to use, according to your project. It can be different every time! I took the oval center of the frame and rubbed on some Distress Inks in Peacock Feather and Peeled Paint to create the sky and ground. The fabulous Train Die is from Frantic Stamper. Just look at the amazing detail on this die! I layered the back end of the train behind the frame so that it looks like the train is coming right out of the frame. The ticket is from PTI's Just The Ticket and I thought this would make a great sentiment piece. This was all layered onto two Memory Box stitched rectangles. One cut using an old map and the other in black to frame it. QUICK DESIGN TIP: Try using papers that aren't normally made for crafting on your projects, such as old maps, book pages, pattern pieces and old greeting cards. This adds interest and is a great way to recycle! You have created a lovely scene with the oval and train die, your colouring is fantastic! Great tip about using non-crafting papers. Old maps could be very useful to use, particularly for male cards! 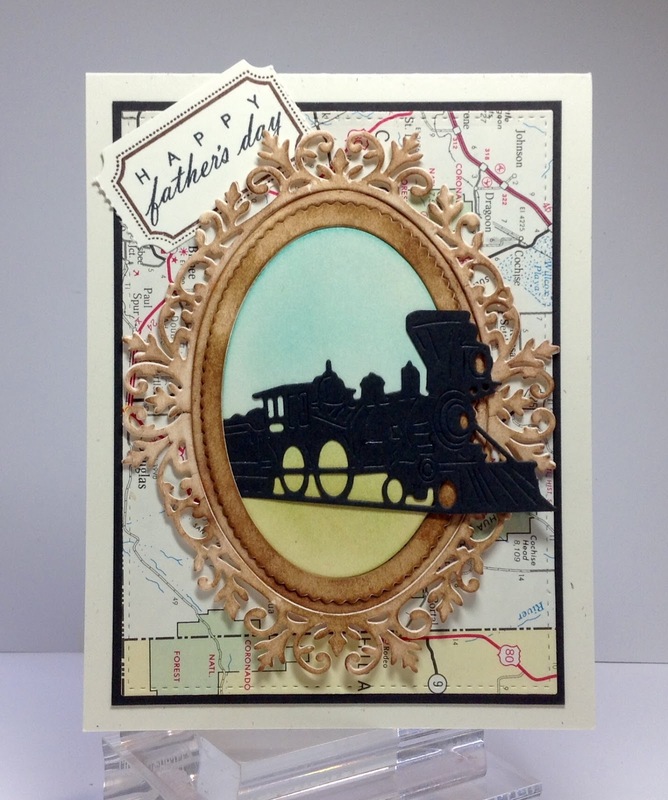 Oh Wow that is just too cool, love the layering of the frame and I do love the detail in that train, that's awesome, I love how you have it coming out of the frame and the map background is a perfect touch, Terrific Masculine card!! Birgit, this is the best card I've seen using this Frantic Stamper train die..........it's amazing what you did with it coming out of the oval die. It really looks like a scene from an old movie where the train is moving across the plains. I have this train die so I know I'll be using your inspiration on a card this way. Thanks for sharing your talent with us all. WOW! Talk about a 3D effect, this is fantastic! And it is so manly! Great Father's Day card! Clever idea using a ticket die for the sentiment. I love this! Beautiful Brigit. Perfect masculine card. Fantastic card. Love the train coming out of the decorative oval.